Pot, or pan — a love affair: Stein’s, mine, yours? Pot’s in the news again today, and my KPLU radio-sidekick and I thought we’d get in on the discussion, adding our two-cents worth on Food for Thought. 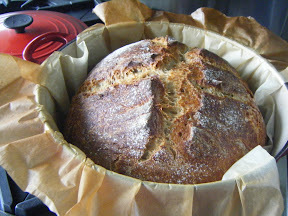 I know that you know that I love my Le Creuset — in particular the 5 1/2-quart workhorse I used for making double-loaves of no-knead bread, as well as any number of soups and stews. My version of Jim Lahey’s Irish Brown Bread (left), and a big pot of spicy carne adovada (right). Stein, who spends even more time in the kitchen than I do, is also a classic-cast-iron skillet fan. And he, too, has a nice collection of well-used enameled cast-iron. Yet ask him and he’ll tell you: his top pot is a 30-year-old wok. Mine’s my cherry-red Dutch oven. So, I was wondering. If you had to name your “desert island” pot. Yes, a single pot — or pan — which would it be?